24 in. Overall Length. We have provided a sound file if you would like to hear this Chimes beautiful sound. 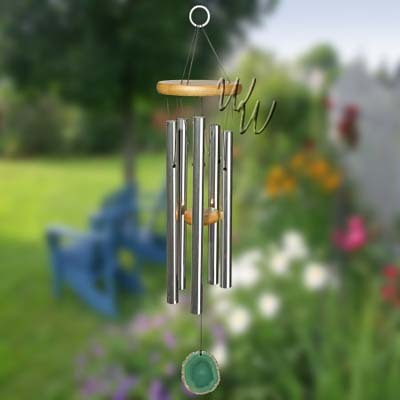 This chime has a genuine agate windcatcher with a gold Celtic Knot silkscreened on it; no two are exactly alike! The delicate twists and turns of the Celtic Knot mean different things to different people - some see them as depicting man's circuitous path through life, others see them as a symbol of eternity, and still others see them as a sign of interconnectedness. However you look at it, it's a lovely chime with a beautiful sound. Natural finish ash wood, 6 silver anodized aluminum tubes, agate windcatcher.